So i decided i needed to review this camera at this point in time. I have now owned it for about a year and have really been testing it in a lot of different environments and situations and feel it is indeed worthy of a review now. First of all let me tell you a little bit about my decision making for buying this camera to begin with. After all the price puts most people off and so it also did for me at first. At the time hearing about the Leica Q i owned Nikon cameras( the D4, the D700 and the Nikon Df) but was also heavily invested into the Fuji system. The Nikon gear i had, filled the need for any professional work i had to do or any more demanding projects i had or wanted to do. And the Fuji gear (the X-T2 and the X100F) i bought mostly because i wanted a dependable travel camera and a day to day compact camera that still could produce beautiful pictures as well as being portable. It did all that for me and more. I really liked my Fuji cameras. And the excellent lenses that i used for my X-T2. I heard from a friend that owned the Leica Q that it was a wonderful camera and he loved shooting with it. I started reading about it and found it to be a really good camera from what i could see. At the time( just before getting the X100F actually) i was on the fence of either getting my X100F or maybe some other great compact camera for street photography. They both got rave reviews and so the choice was a tough one even then. The decision in the end became the X100F for a few reasons i will detail now. First it was the price , which i had a hard time justifying because i also saw the opportunity to buy a lens for my Nikon cameras but also get the X100F and still have money left to get something else in comparison to if i had got the Q. Also another reason was the risqué of getting robbed. yes using a Leica as a street shooting camera in my mind was going to be tougher for me since i felt that i would be conscious of the price all the time picking it up in less populated or rough areas. Those two reasons alone made me crossing the Q off my list at that point in time..
Time went by and i used the X100F happily and took many great pictures with it. It complimented my X-T2 superbly using the same batteries and other accessories made it a great duo to depend on for different situations. However, overtime having two systems with all those lenses( yes i know…a pretty good ”problem” to have by most peoples estimations) became something of a hassle for me every time i was going out somewhere to shoot. Do i pick the Nikon cameras with lenses or the Fuji cameras. Then what lenses should i bring for the X-T2? It actually became something of a hinderance for me and took away some of the fun and simplicity of taking pictures. It sort of killed the desire and creativity in me for a period of time even though i really enjoyed the gear itself. So i started toying with the idea of selling my whole Fuji System that i was so heavily invested into, and then buy a Leica Q. I spoke to my friend that i knew shot with it on a regular basis, and he still used it as his go to camera and was still in love with it. Of course he really tried to convince me into getting it, but i also felt that he was very sincere in his feelings towards the Leica Q. I started warming up to the idea of making a switch and sat down to really think it through before i would take the plunge. I also had to take into consideration that it was an ”older” camera by now by today standards and how much value it would hold if i after buying it for some reason decided i did not like it. When you buy something that expensive you really have to think it through properly and take everything into consideration in my opinion. After all we loose so much money all the time in this hobby or line or work that just going on a hunch or feeling is a bit reckless in my opinion. I was not too scared of that though after reading how happy people had been with this camera but also that it stood the test of time really well even today. People still sold it for a good amount and it still rivaled or competed with the other top of the line compact cameras that were sold today. Browsing around on different sites selling the camera i quickly found out not many here in Sweden actually had it in stock. I found a few though and one of them were selling the Q with as the Platinum addition. I decided i would take the plunge and started selling off my Fuji gear one piece at a time but not loose too much money at the same time made it a slower process than what i had hoped for. After about a month i had sold most of it and ordered the Q. The package it came with was beautiful, and right from the start you get the feeling of something very special. And the camera itself was also one of the best looking cameras i have ever seen or held to be honest. Right away i could feel the sturdiness of the camera body, it felt like a german tank in a small package! Felt really great to hold and maneuver. The simplicity of the menus and where they had chosen to put the buttons were really intuitive and well made as well. Wheels and buttons also felt sturdy when pressing them, like something that would not break after many years of usage, really a reliable feeling all around. And like i have seen in many other reviews it right away felt like a camera you want to pick up and shoot with, and i hoped that it would inspire me to do just that in the future and i will tell you a little about that further down and also if it held up to my pretty big expectations. The following weeks i started to get acquainted with my new friend, fidgeting with controls and menus and trying to customise it in the way i liked it. Coming from Fuji cameras with so many options and buttons just playing with the Leica Q made it feel so simple in comparison. I wont lie though, a part of me those first weeks really missed some aspects of my X-T2 and the lenses as well. I realise that the Q will not fill the big shoes of all the gear i used to have entirely. But most importantly it will fill that need of a smaller camera being able to take great photos and being versatile wherever i take it and doing it in a simple way making me less stressed over the technical side of things. So i already knew that the first month or so would be a learning curve and being able to cope with that ”loss” of what i was used to and the doubt nagging in my mind sometimes if i had made the right choice. I brought the Q pretty much everywhere, to the children birthday parties, hiking, photowalks in town shooting street, and most other day to day activities. So how doest it hold up during those activities and where does it shine and where does it show any shortcomings in my opinion? Well i would say its strongest point would be as a day to day documentary camera. To be able to document pretty much everything around you from nature, portraits of kids and adults or animals in their environment and street scenes when thing are happening in the moment. Because of its pretty fast and accurate Af you rarely miss any shots with the Leica Q. Also the lens itself renders beautifully and give you very sharp images when you nail the focus. I know it has OIS but i read in a few places it degraded the IQ a tad (not that i really have seen any difference comparing) so i used it a few times in the beginning but rarely felt i had any need for that. I used it up to over 6000 in ISO very comfortably without ruining the shot. So you are really able to shoot in most lighting conditions which is also incredible for such a small camera and also makes it a companion you know you will always be able to get some usable and most of the time beautiful photos out of if you know how to use it. I know many say its designed as somewhat of a perfect street photography camera and i heard the designers had that in mind reading on some forums. And yes with the fast Af, very simple menu and simple button layout it makes for a very fast and simple camera to capture the moment. But for me it has two ”shortcomings” for being the perfect street camera. And the first being its size, sure for giving you the superb IQ its a small camera, but its not at all pocketable. And in my opinion to be a perfect street camera its supposed to be pocketable just so you don’t have to go down into your bag every time you want to capture a moment. Then why don’t you just have it on a wristband so its out at all times and ready to shoot with you ask. Well then we arrive at ”shortcoming” nr two for being the perfect street camera. The allure for thieves to grab it when you have it out and about all the time. With the X100F i never really had that feeling, sure that camera was also not cheap, but it was still not in the same league and wont set you back as much as the Q. But that is also something that might be true for just myself, i know many people shooting with Leica cameras and that are not worried at all bringing it pretty much everywhere. I must say that after using it for a while now, that sense of awareness when i shoot with it has become less of a problem and i find myself using it more freely than i did in the beginning. Still, it is something to be aware of if you are scared of using expensive equipment around cities and other populated areas. Its still a terrific street camera for its usability though and i have been shooting street with it a lot. Its just that it would be an even more perfect camera if not for those two things. But for shooting day to day events and day to day life its perfect. Its small enough to not be intimidating, and it also makes people interested( not a good thing in rough areas!, speaking of thieves) and i had quite a few people coming up to me wanting to discuss Leica cameras or wondering what kind of camera it is. Its also very silent so just walking around with it photographing family or people in general most wont even notice you or hear you taking their photos. So i would say its superb for that kind of photography in mind. Another great style of shooting with the Q would be nature and travel photography in general. Its not a heavy camera and traveling with it( except maybe for the theft part again) would be great. You just need a small camera bag and its not heavy to carry with you in most places. The colors and rendering of the lens are beautiful, and you can take very nice detailed images of landscapes and use your macro( which i will adress later on) for bugs and flowers etc on your travels. Its also a lot of fun having that versatility and being able to capture most things on your hike or trip. Also being able to get that shallow depth of field with the excellent 1,7 aperture Summilux is great. Makes for some really creative and nice shots of those kinds of subjects. How does it fare in portraiture? Well actually i have used it a lot for that. And although the 28 mm FOV is not the most common perspective for a portrait, the colors and shallow depth of field makes for some interesting and beautiful portraits. Especially shooting kids in my opinion. But i have also shot some nice photos of people in their environment, and there again comes in my mind one of the pros of the camera, the ability to take good documentary styled portraits like on a wedding for example. I am actually going to test it on a wedding this summer, so i will know for sure if its a great wedding camera overall after that( i hope i don’t have to eat my own words after this summer…), but in my mind using it now for a while it should be great for that as a backup camera, documenting the bride and groom getting ready before the ceremony. And shooting the dinner and dance afterwards as well. The Macro function. With a little flick on the lens itself you turn the lens into a macro lens and while im not into Macro that much myself, its a pretty cool function to have when you do want it. I heard it was a pretty decent macro at that. Touch Screen, which is kind of nice to have.I use it to scroll through my pictures in playmode from time to time. Also it has a Touch AF function which is great for street photography when you don’t want anyone to notice you taking their picture. Something they adressed in their newest firmware was the ability to make user profiles, and that makes it able to now program a user profile with touch AF and one without the touch af so you don’t have to dive into the menu to switch between regular Af and the touch Af function. That was something that i felt was quite annoying at first getting the camera, because in the earlier FW that was not an option. So i am very happy Leica adressed that after a while. Its also very good for manual focus, and while i don’t use it THAT often i know people using other Leica cameras are very happy with that on the Q. It has a great focus peaking option where you can set a certain color to help you nail the focus and that work great. The manual focusing is also very smooth on the lens and feels great to use. Another not that uncommon feature is using it in monochrome to see in black or white when you shoot. I have not used that very much but its a nice function to have for street photography when you want to capture in only monochrome and makes its easier to compose your shots in my opinion. The images still comes out in color when you download them in RAW though but its nice if you want to download them to your smartphone for example. That is another feature that of course exist in most cameras nowadays. The wifi function and being able to downloading your images using the Leica app. The app and function is not the easiest one around and not the most intuitive, but after getting it to work and learning how to download them its a great thing to be able to do. A must for a camera you want to use on a day to day basis in my opinion. Whats more to say about the Leica Q. Well for me hearing about the Leica ”experience” and the Leica look i was quite interested and keen on seeing what that was all about. I can say using it those first few weeks i did not see anything pop out of the screen screaming Leica. However using it now for quite some time i can attest to that at least the leica Q has SOMETHING..not sure what that really is or if its something that you in your subconscious have been looking for and therefor makes you read into it too much, but there is something very unique that i like, in the rendering of the lens and the colors straight from the camera. The image quality is great, and you rarely have to tweak your images much after downloading them. In monochrome there is also something special using the Leica Q, i cannot say why, but they just look very nice the way i want them to look. And the 28 FOV was something i at least had no problem getting used to. I like using 24mm a lot for documentary style photography and the 28 is just slightly more narrow than that. So its even more suited for portraiture in the environment than the 24 for example. I never bothered getting any special accessories for the Q. You get a strap which is really nice in the box, and since it was the platinum edition you get an upgraded steel grey rope styled one which is even cooler than the one you get in the black edition. Other than that i got a really good ”stealth” cover from Teciac (shout out to them, 3d printing at its best!) which besides covering the red dot for shooting in those rough areas also give you a lovely extra grip so you feel even safer handholding it without the strap when you do your photowalks. So what is my overall opinion and experience of the Leica Q. It certainly tick most of my boxes for what a camera should have. It is fun to use, it takes beautiful crisp colorful images. It is easy to use and very very intuitive. Its lovely to hold and the thumb grip that is on the back of the camera give you a pretty decent comfortable grip despite the camera itself being a little slick. The ergonomics are great with the button layout and the feel of using the camera and overall the experience holding and using it is a magnificent experience in my opinion. The only things i think could be better in my mind would be maybe adding a few more Fn buttons to be able to customize it even more. But at least Leica listened to their customers and added some more usability in their latest FW and you now have the user profiles which you can program into several different profiles for shooting in different types of situations and environments. And other than the size and maybe the price this camera is probably one of the most fun and better cameras i have shot with in my life. The only other camera that gives me the same feeling and as much fun to use would be maybe my Nikon Df, and after that maybe my Fuji X-T2 which was also a fun and great camera to use. But the Leica Q will definitely have a special place in my photography heart. I hope this in some way help you and others out there maybe being in my shoes at that time, not sure what camera to get and maybe have the same style of shooting as me and being stuck in a dry spot of creativity. 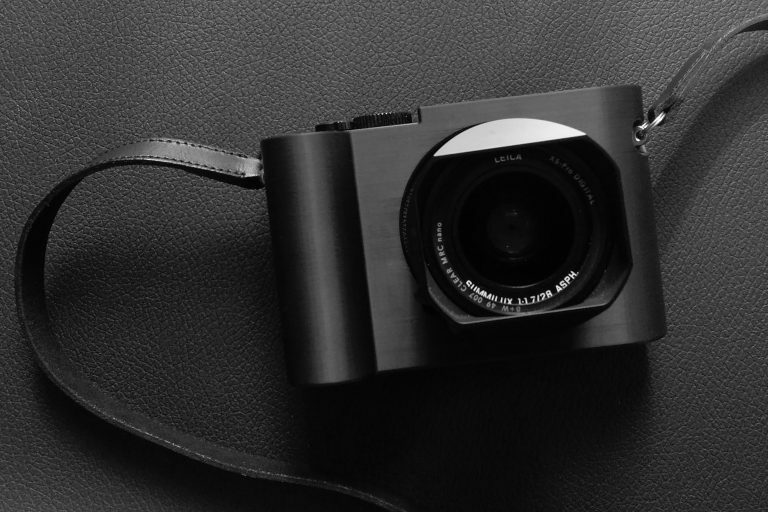 the Leica Q would definitely help you get out of that and be inspired again. Trust me. Since you liked the ”stealth” cover and wrist strap so much a photo of them would of been nice. Did the cover interfere with any operation of the camera, like changing batteries? I hope you continue to enjoy your Leica. Thank you and good point! The cover was great in that regard, it does not interfere with the battery door or anything like that or the memory card. So that is what i really liked with it. the things i saw for the Q otherwise always was in the way for the battery door or the card. But this one is a greta design. Sure its not as nice looking as a leather half case for example, but to protect and fill its purpose its the best i have seen or used.